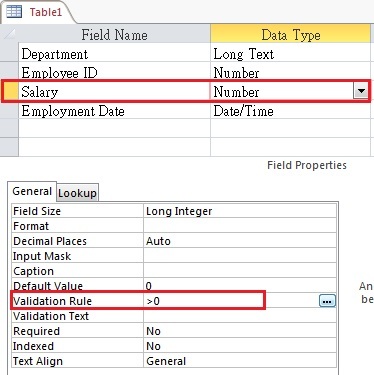 This Access tutorial explains how to validate data type and data value in Access Table using Data Validation Property. When you create a Table, you can control the data type of the Field in Design View of the Table. Assume that you have created a table of the following Fields. When you type a Text in Salary, you will be prompted an error, and you cannot save the record. You will not be able to save the value even if you are using Query to input the data. This kind of validation is for Data Type only, so what about the value of the data? Switch to Design View of the Table. Switch to DataSheet View of the Table. Now change a salary value to -1, the following error message will pop up. Instead of showing the above message, you can customize an error message in the Validation Text right under the Validation Rule. I refer to Microsoft support and find some examples below. Number BETWEEN 0 AND 1 Enter a value with a percent sign. (For use with a field that stores number values as percentages). Date >=#01/01/2007# AND <#01/01/2008# Date must occur in 2007. Date <Date() Birth date cannot be in the future. Date [EndDate]>=[StartDate] Enter an ending date on or after the start date. Text M Or F Enter M for male or F for female. Text LIKE “[A-Z]*@[A-Z].com” OR “[A-Z]*@[A-Z].net” OR “[A-Z]*@[A-Z].org” Enter a valid .com, .net, or .org e-mail address. I refer to Microsoft support and find a list of Operators that can be used in Data Validation. NOT Tests for converse values. Use before any comparison operator except IS NOT NULL. NOT > 10 (the same as <=10). Note You can also use AND to combine validation rules. For example: NOT “UK” AND LIKE “U*”.